1) Jobs around the world for the Middle Prepared Students have disappeared. 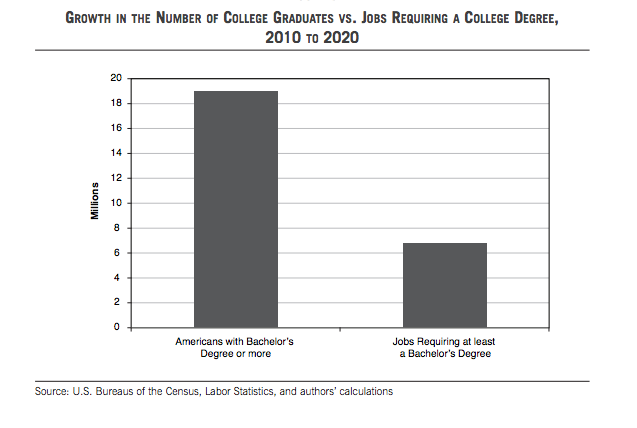 2) College graduates took jobs that require little formal education. "As we [WSJ] reported in July, before, during and after the recession, demand for one sort of worker has been persistently stronger: personal-service jobs that involve assisting or caring for other people — from waiters to home-health aides. Bureau of Labor Statistics says, 545,000 jobs have been added in the past two years in what it quaintly calls “food services and drinking places.” That is about 30% of the net increase in employment (1.84 million) between July 2010 and July 2012. Editor's Note: Neither require an academically oriented secondary education. Demand of the most skilled and educated — from engineers to specialized factory workers — has been relatively strong. Globalization and technology have eroded demand for routine middle-skill, middle-wage jobs: In factories, assembly jobs have been eliminated by automation or moved overseas; in offices, tasks once done by humans are done by computers and voice- response software." Editor's Note: Few of these under- employed college graduates have the mathematic ability or study kills required to be engineers. "Workers with associate's degrees in STEM fields out-earn 63 percent of people who have bachelor's degrees in other fields. Almost half of workers with bachelor's degrees in STEM fields out-earn workers with Ph.D.'s in other fields, according to the Georgetown University Center on Education and the Workforce" STEM is the new Liberal Arts where graduates and end up in any many careers. But America might very well have plenty of STEM specialists already. So many, in fact, that the job prospects for STEM graduates are actually pretty dismal. Perhaps that’s the point. 1. Do We Really Have a Scientist Shortage? 2. 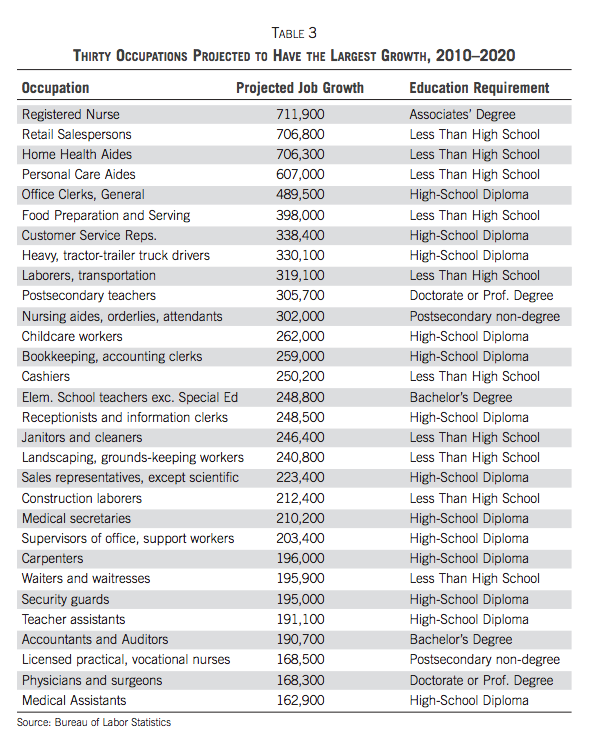 Stem labor shortages Microsoft report distorts! Some feel an oversupply in STEM graduates already exists.. Recently, Derek Lowe, a medical chemist of pipeline.corante.com wants innovation. "America Does Not Have a Scientist Shortage" he blasts in his one-page Discover magazine 10/12 article. "In reality, the United States has been producing plenty of scientists." 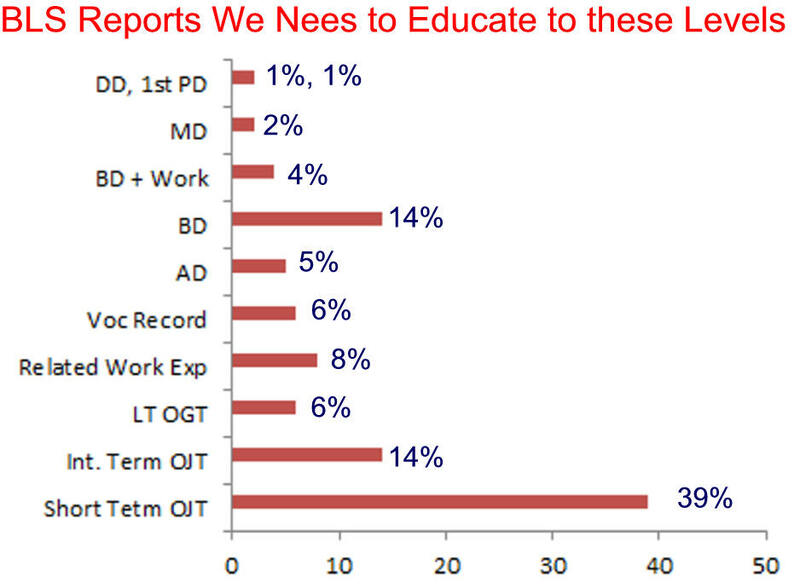 Graduates are up 35% in a decade but they languish in post-doctoral positions. U.S. companies can pay $55,000 for a domestic scientist or pay $6,000 for an Indian scientist. "We need to identify the best and expose them to real research..." Spur them on with contests. "We are on the right track with big-money contests like XPrize." There are many such contests. Determining which of the new companies providing seed money for contests could bring substantial return. Supply is up, demand lags, creative minds needed. The Ugly Truth If you are good at STEM stuff and are willing to study more than the non-STEM majors, Go For It because that is where you best job will be. STEM graduates are often are our best and brightest. 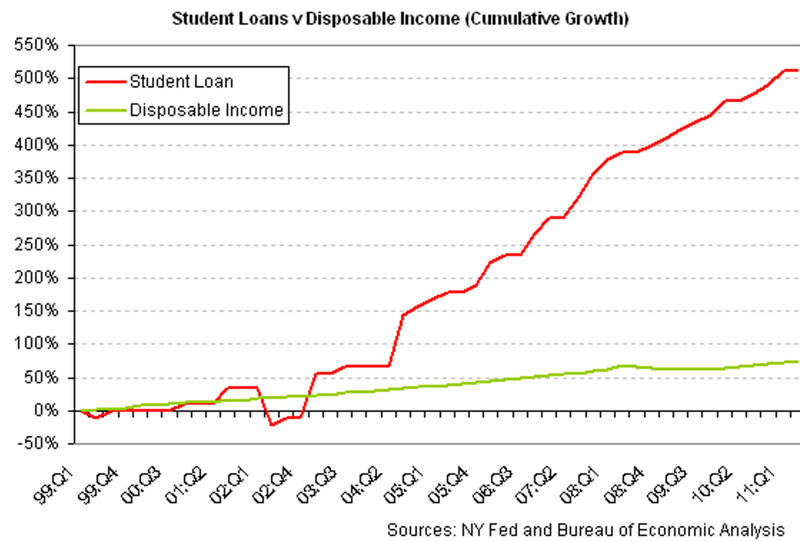 They used to major in Liberal Arts and go to work for investment houses on Wall Street, no more. Stem majors do more work, earn higher wages. Bill Gates has been touring the U.S. in early 2013 lobbying for newly minted U.S. foreign college graduates to get visas to stay, work and maybe settle. This increase in supply will push wages down and because all new graduates know new technology and often bring more drive to the job, will force workers with twenty years experience to change career. The useful life of programmers is dropping fast and those devoting time and money to education should be aware of this. "... After graduating from the National Technical University of Athens [a five year prestige's school], Vlasios Ntizos," "..., is one of 29 European youths who were chosen by Germany’s biggest engineering company." He beat out 1,000 Greek student applicants. Siemens had 45,000 applicants for this year's apprenticeship class. "Siemens spends about €177 million ($222 million) each year on apprentices (they get paid roughly $1,000 a month), with 1,350 trainees and students passing through its facilities in Berlin. A regular apprentice costs as much as €100,000 for a three-year program, which Siemens hopes fosters a sense of loyalty that will last a lifetime." "McKinsey, a consultancy, reports that only 43% of employers in the nine countries that it has studied in depth (America, Brazil, Britain, Germany, India, Mexico, Morocco, Saudi Arabia and Turkey) think that they can find enough skilled entry-level workers."... "The best way to do this is to revamp vocational education, which outside the German-speaking world has been treated as the ginger stepchild of the education system." "...some far-sighted countries, schools and firms are busy reinventing vocational education, McKinsey argues. South Korea has created a network of vocational schools—called “meister” schools, from the German for “master craftsman”—to reduce the country’s shortage of machine operators and plumbers." "...Academic drift is one of the most powerful forces in educational life: look at the way Britain’s technical schools were allowed to wither on the vine and its polytechnics converted into universities. [Editor's Note: The oversupply of academically directed students has brought down salaries. 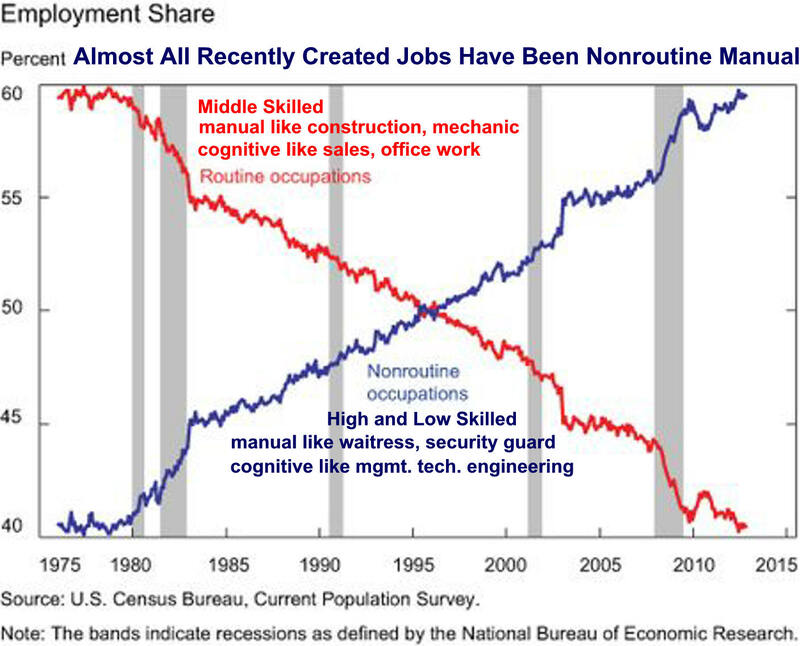 Vocational training is for increasing non- routine cognitive jobs. URSULA VON DER LEYEN, Germany’s labor minister, likes to point out that the two European Union countries with the lowest unemployment, especially among the young, have dual-education systems: Austria and Germany. Like Switzerland, they have a tradition of combining apprenticeships with formal schooling for the young “so that education is always tied to demand,” she says. When youths graduate, they often have jobs to walk into." ...". Germany recently signed memoranda with Greece, Italy, Latvia, Portugal, Slovakia and Spain to help set up vocational-education systems." ..."Youths not interested in, or qualified for, university sign up for a program in which they work three or four days a week for a firm that pays them and teaches relevant skills. The rest of the time they spend in school, completing mostly specialized courses." THE ARTICLE ENDS BY POINTING OUT THAT ..."German success today surely owes more to its labor-market and welfare reforms of a decade ago and to unions’ wage restraint. 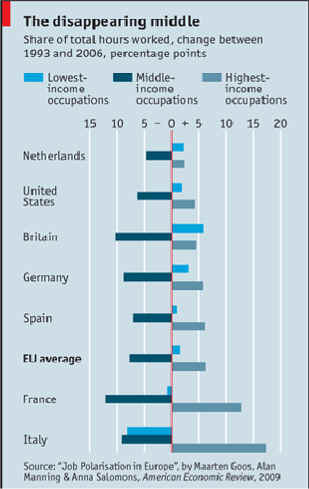 In an ageing and shrinking population, demography also helps, as fewer German graduates choose among more open jobs." Businessweek, The Week , USA Today, Business Insider .. 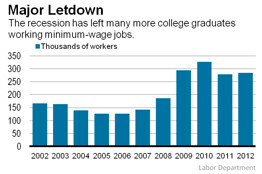 Does Not Create Demand for College Graduates. Goal of Academics and Publishers is to Make Money. Bright Students Are Serviced but Face Severe Competition. 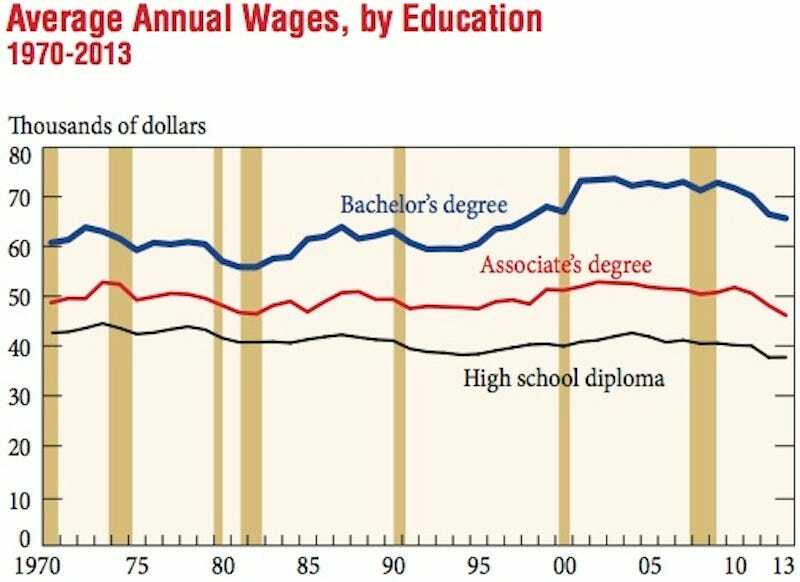 My Keene State College 1990 Economics 101 class was given data showing that average college graduates make much more than high school graduates. They had seen it before. That is why most of them were in college. Then I showed them median income of college graduates. They were disappointed with the lower number. I explained how some really high earners make the mean higher than the median. Then I showed them data indicating the bottom quarter of college graduates earned about the same income as high school's top-quarter. They became more unsettled. Then I gave them the lowest income statistic of all, median income for those with just a bachelor's degree. Those with higher degrees were left off. From the back of the room I heard "you mean they are ripping us off. 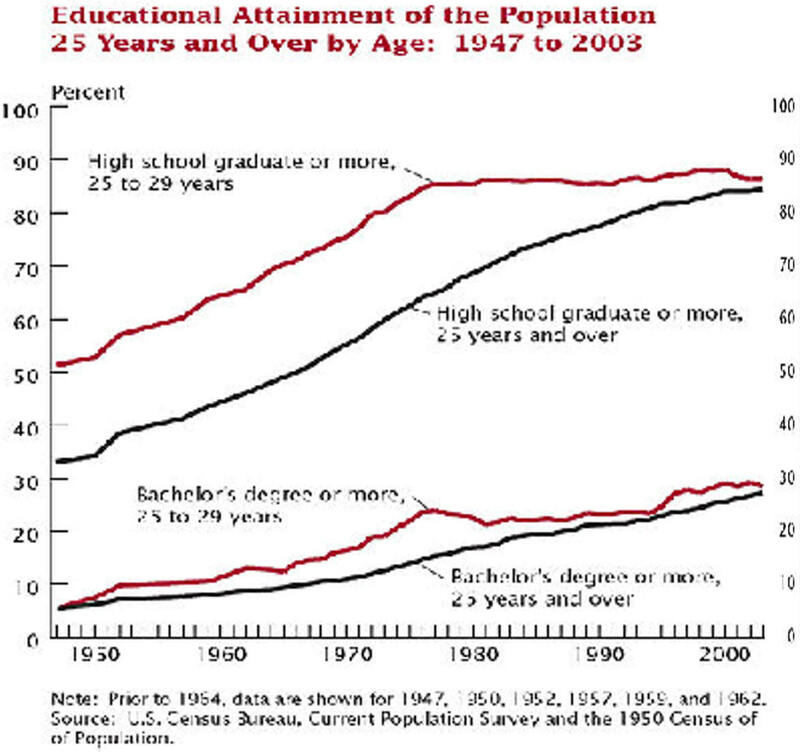 It took about twenty years, but I pleased to report that, because of the Great Recession, mass media coverage of the decreasing economic return from a college education is no longer sporadic . But like any unwelcome news, parents, teachers, and politicians will be the last to react properly. The collateral damage has been immense. It will continue to be so unless some responsible mass media helps makes an educational system that improves the well-being of all students . 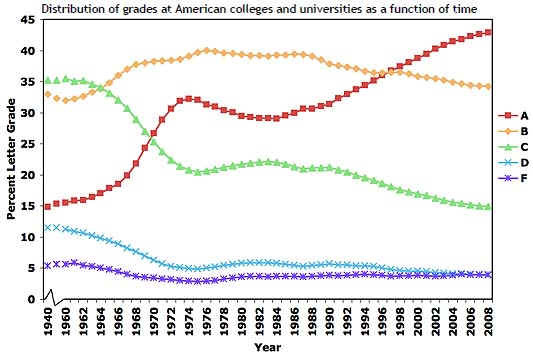 Here is the collateral damage of our love affair with college. College graduates who can't find a job and dropouts owe over one trillion dollars in outstand college loans and are finding they do not have the skills to earn a positive economic return from their investment. But some took the path less traveled. My fourteen year-old nephews announced he wanted to attend a neighboring carpentry high school. Four years of getting up early and getting a ride from his father to grandmother's house where he waited for the school bus to take him to a new, strange school. At fourteen! After school he walked the three miles home from grandma's house. No one told him from anyone, he just didn't like academics and decided on a vocational education. Now a successful small contractor, his biggest problem is convincing his wife they don't need a new Volvo every two years. His younger brother was much more academic, but found school a waste of his lazy, but conniving mind. He dropped out early in the 9th grade, eventually went in the military, kept looking for a good job in corrections until he found a unionized one working for the state. No one had to tell him that investing in a 40K in addition to the state retirement plan was a good idea. He also bought car mortgage insurance a year before not being able to pay said liability. "Many researchers have documented a strong, ongoing increase in the demand for skills in the decades leading up to 2000. In this paper, we document a decline in that demand in the years since 2000, even as the supply of high education workers continues to grow." 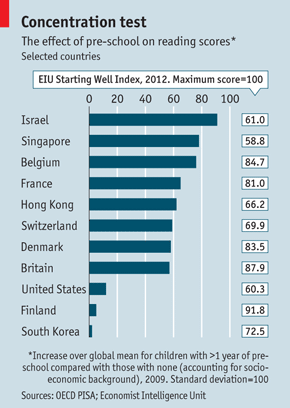 "Finland on top (it scored direly in the OECD study). At least 98% of children aged five or six are in pre-school education there. Finland also dominates the overall league tables for education performance, so perhaps the scope for improvement is slight. Other enthusiastic providers of pre-school education like Sweden, Norway, France and Belgium and Denmark do not score particularly highly on attainment in later education, whereas Japan, which combines early-years provision with a fiercely competitive exam culture, excels. So too does South Korea, where the state until now has provided under half of pre-school places. So pre-school is no panacea, says Andreas Schleicher, who oversees the OECD’s big triennial PISA report on educational attainment. “Drilling children” in early years does not lead automatically to learning gains, he says." Editor's Note: I'd trade two more years of early childhood education for two less years of high school in a second. Academic kids not mature enough to leave home for college could go to junior college or work for a while, maybe as workers in a vast public/private pre-school industry. People who work for colleges are increasing their own economic wellbeing by using high grades to make demand inelastic and milk the public. Were college catalogs changed to say average is B+ to A-. In These Selected Countries Income Was Less Equally Distributed, Some Northern European Countries and Canada Increase $ to the Poor, The US and GB did not! Both England and the US have given more to the rich! Has it affected Education?